Over the next three years, Rim Technologies, LLC will be offering $1 million in scholarships for military spouses and dependents. Our “Thanks a Million” scholarship program offers cyber, software and IT Training scholarships from May 2017 through 2020. Our scholarships will cover up to 75% of the cost of courses for military spouses and dependents, so get in touch with us today if you are interested in learning more! We’ve donated over $16000 in scholarships this month already. 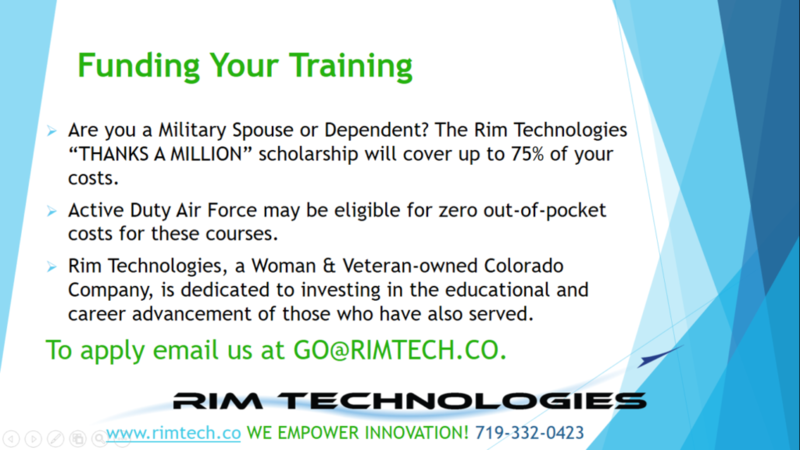 Contact us at GO@RIMTECH.CO or 719-332-0423 to sign up today or to learn more about our “Thanks a Million” scholarship program! National Guard and Reserve dependents are encouraged to participate.